These gold coated “Mr.”, “&”, and “Mrs.” mirrored fiberboard table signs are a welcome item to have on a certain table. The Mr. sign measures 9.1 inches by 0.3 inches by 7.7 inches, the & sign measures 4.8 inches by 0.3 inches by 5.9 inches, and the Mrs. sign measures 11.7 inches by 0.3 inches by 7.7 inches. Some assembly required. 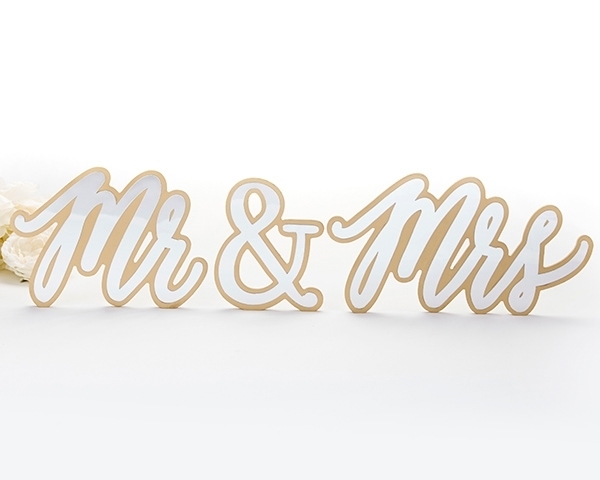 An item that is of utmost importance to the bride and groom’s table at a wedding, the Mr. & Mrs. Gold Table Sign is a necessity. The fibreboard signs are gold coated and feature a mirror like finish that is just in line with the ceremony’s nature.